A brilliant new biography of the mystic poet and artist William Blake – and the first to reveal the full complexity of the man, with unprecedented insights into his intellectual, spiritual and creative life. On BBC Radio 3 in April 2013, a call was issued for a specifically English anthem. Top of the list came ‘Jerusalem’; it touches the parts other anthems can’t reach, including the National Anthem. ‘Jerusalem’ transcends the National Anthem because it is not a nationalistic anthem; it expresses a universal yearning in the English soul, something vital and appreciable by people across the Seven Seas. Americans need no reminding that William Blake inspired Ralph Waldo Emerson and US visionary Walt Whitman. Though Blake called himself ‘English Blake’, he would have been a poor poet and prophet if his message spoke only to one country. Some of his most insightful commentators have come from India. Blake addressed Man – and what had gone wrong with Man – and how to put it right. Many people today yearn deeply for some kind of spiritual revival, not in the ‘Billy Graham’ sense, but a renewal of the faculty of vision, a re-embodying liberation of ourselves and of our narrowing culture. We look, mostly in vain, to television and cinema, finding confusion, superficiality and exploitation. Many of us feel lost among our own objects – and feel objects ourselves, numbered and taxed. The universe, for all its scale, has begun to feel closed, our lives imprisoning, our best thoughts and feelings closed in. Grand opportunities are thrown away, day in and day out, in the ceaseless media mayhem. 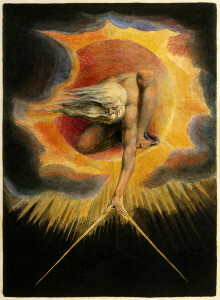 William Blake addressed our predicament at the dawn of the materialism that has enveloped us. He did so in poetry, painting and music (sadly his tunes, if not his verses, are lost to us). Blake can put us back in touch with paradise while on earth, as Kathleen Raine stated. Toward the end of Kathleen’s life, she would say simply: ‘Blake is my guru. He taught me everything.’ It was clear when you met her, that Blake – who could never afford a university education – knew everything worth knowing. But Blake the guru has been lost under a myriad of inadequate biographies, college dissertations and arts commentaries, too frequently written by people who have not found the luminescent keys to Blake’s symbolism and liberating spirit. Too often, commentators strain at gnats and swallow camel-loads of trite or obscure, overly literary interpretation. 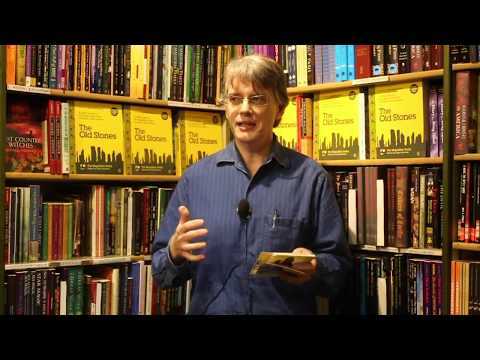 Appropriate words appear – like ‘spiritual’ – but only in rare cases do you feel the writer really knows (as you would know a person) what he or she is talking about. It was long ago observed that had Blake been born in Germany, he would have been as famous as Beethoven, with statues of him in the cities and his books required reading for the cultivated. 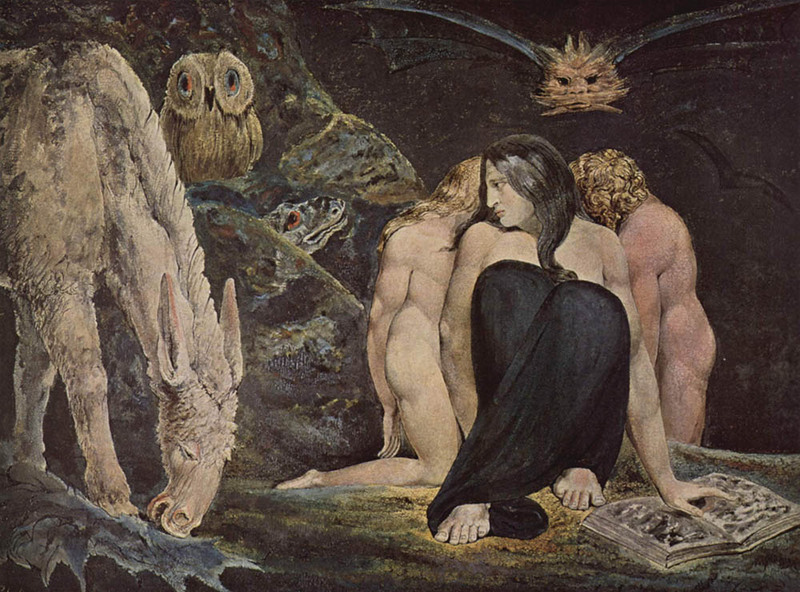 It took a century after his death in 1827 for Blake to be appreciated at practically any level beyond a tiny coterie of supporters (viz: Samuel Palmer, John Linnell, Dante Gabriel Rossetti). The star that rose to bring the poet, engraver, painter and philosopher to ‘national treasure’ status rose steeply in the late 1960s when the efforts of poet-prophets like Adrian Mitchell (1932–2008) and free political experimentation let loose a visionary, youthful energy, formerly suppressed by party orthodoxies. Suddenly, with LSD, Pink Floyd, Yoga and Sufism in the air it became possible to join Blake in seeing, really seeing, ‘a heaven in a wild flower, a world in a grain of sand, and eternity in an hour’. Even science seemed to be on the side of the visionaries: Jacob Bronowski, presenter and writer of the 1973 BBC documentary series, The Ascent of Man, was one of Blake’s biggest fans. 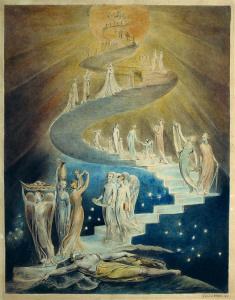 Aldous Huxley took to heart Blake’s line, ‘When the doors of perception are cleans’d, then we shall see all things as they are: infinite,’ and he took the concept to his influential book on expanded consciousness, The Doors of Perception (1954). Jim Morrison took those same ‘doors’ as the name for his revolutionary poetic/theatrical band, The Doors – who lit the fire of everyone who was listening after they burst onto the crowded scene to ‘Break On Through to the Other Side’ in that year of so many ‘Songs of Innocence’, 1967. Innocence soon became Experience – with Jimi Hendrix – and William Blake was there too with comfort and guidance through the darkening years that followed the first brief opening of perceptual doors in the late 1960s. Everyone now realizes that something happened in that time, though few are sure what exactly. Blake wrote for us because he perceived, so far ahead of his time, that the philosophy of materialism would dominate the world, but not defeat ‘the Ancient Man’, ‘the Poetic Genius’, the ‘Divine Imagination’. He was ‘not a number’; he was ‘a free man’. Through fires of rebellion and cataclysmic change, the ‘Child of Freedom and Rebellion’ would rise again, challenge the dominance of abstracted Reason, and its baleful Law, and break the dams on the infinite worlds within. The spiritually Free Man and Woman would rise again and re-integrate the Broken Man, living in darkness, into the heart and centre of his or her own true being. Eternal Life would mean something to the objects of the Western world once more. Blake’s titanic spiritual effort has been obscured and variegated by numerous academics and specialists who, in my judgement, have often not seen the wood for the trees, missing the essence. Thus, for some, Blake is a ‘romantic poet’ with some prescient ideas about poetic form. To others, he is a proto-socialist revolutionary, an angry Cockney ‘Digger’ with some ideas about free love – ‘one of the lads’ whose ‘visionary side’ is a bit of an aberration: allegedly too obscure for ‘modern people’. Chief among exceptions to prevailing misapprehensions stand, in my opinion, commentaries by WB Yeats and Kathleen Raine: they make sense of the man. Blake was concerned with a total spiritual revival. If you had asked him to paint the church at Felpham, Sussex (where he lived 1800–03), he would not think you meant a portrait or landscape. Having little time for either genre, he would want to paint the church! From top to bottom, inside and out, restoring the colour of a popular church of a lost Middle Ages, before human beings became, in the words of Orson Welles, paraphrasing Blake, a ‘poor, forked radish’, cut adrift from immortality. So how does the popular love for ‘Jerusalem’ fit into all of this? 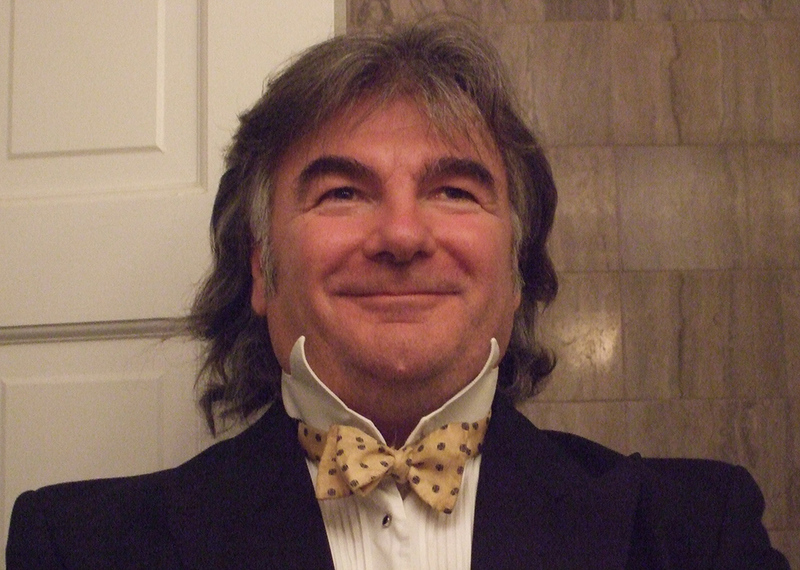 In many ways, and at first sight, there is little connection between enthusiasm for the ‘hymn’ and the biography of the person who wrote it. When I have asked singers of the song if they knew who wrote it, they have oft expressed surprise at the question. What does it matter? We shall see, however, that to understand the writer is to understand the hymn. If we care about the hymn, we shall want to learn about its author. Misunderstanding of the man – and therefore of the hymn – was plain, nay, was stark, from the moment in 1916 when ‘Jerusalem’ first entered popular consciousness, more than a century after the composition of the lyrics. As many readers will already know, ‘Jerusalem’ was not even a hymn, nor can the stirring verses accurately be described as a ‘poem’. And ‘its’ name is not really ‘Jerusalem’; the verses that we know, which have been subtly changed, did not have a name because they were part of something else. The lines beginning ‘And did those feet in ancient time…’ come from the preface to Blake’s epic poem Milton, which he began writing around 1803–4 but which he did not complete for a decade or so. A century later, Poet Laureate Robert Bridges included the verses ‘Jerusalem’ in a 1916 anthology with patriotic intentions called The Spirit of Man. This is odd, because the first edition of the Oxford Book of English Verse (1900; edited by Arthur Quiller-Couch), to which Bridges contributed, included ten poems by Blake, but no ‘Jerusalem’. Somebody introduced the lines to Bridges who, encouraged to use his position to raise morale in a war feared too costly and potentially endless, decided the lines could inculcate the right spirit of national self-sacrifice to a higher cause (‘building Jerusalem’, or the New Jerusalem – a vision from the Book of Revelation, familiar to the scripturally aware people of the time). Bridges wanted Blake’s words set to music for a rousing ‘Fight for Right’ campaign meeting to be held in London’s Queen’s Hall, so he approached composer Sir Charles Hubert Hastings Parry (1848–1918), who had composed the beautiful melody ‘Repton’ to the popular hymn ‘Dear Lord and Father of Mankind’. Bridges thought the so-called ‘Jerusalem’ stanzas, as lyrics, would remind people of what was at stake in the war, along with a vision of what could be made out of the long struggle: ‘nor shall my sword sleep in my hand until we have built Jerusalem in England’s green and pleasant land.’ The ‘sword’ could easily be taken as a crusading equivalent for a rifle and bayonet. People were fighting for a better future, a Godly future vouchsafed by Christ’s favour for the land that the Lamb of God – willing to be sacrificed – was happy to be identified with. There was not only a ‘green hill far away’ where the ‘Lamb’ was crucified, but also a green and pleasant land threatened by Germans in their collective devilry. Personally averse to the possible ‘jingoism’ of the ‘Fight for Right’ campaign, Parry was uncomfortable with the use of his melody and arrangement when he presented the finished work on 10 March 1916. Nevertheless, 18 days later, Queen’s Hall saw it performed with organ and choir to rapturous appreciation. Parry’s doubts, however, were not allayed by such red-blooded popularity. In May 1917, he withdrew his musical support from the ‘Fight for Right’ campaign. The song was in danger of disappearing from the repertoire when Millicent Garrett Fawcett of the National Union of Women’s Suffrage Societies requested Parry to permit its use on 13 March 1918 at a Suffrage Demonstration Concert, and subsequently, as a women’s voters’ hymn. Women saw another aspect of the beauty of the work. Thanks to them, we know it still. They were not alone in their approval. When King George V heard the orchestrated version prepared by Parry for the Suffrage concert, he declared a preference for ‘Jerusalem’ over ‘God Save the King’ – an irony Blake would surely have appreciated. The combination of poetry and music cast a spell over listeners akin to that which Sir Edward Elgar’s ‘Nimrod’ held over Winston Churchill. ‘Jerusalem’ spoke of spiritual struggle as the highest purpose of existence, that inner struggle which gave life its essential and transcending dignity and to which the world was blind. Parry himself was pleased that ‘Jerusalem’ would, in the women’s hands, bring a sense of joy, of something good being done that would brighten lives. He understood that ‘building Jerusalem’ was not something to be achieved with bombs and bullets that knocked people and things out of existence: it must be built with the inner commitment of lives devoted to a life higher than ordinary selves. What artist could wish for more? England’s greatest composer, Sir Edward Elgar, would write his own arrangement of Parry’s mysterious melody. Inevitably, socialists got on the bandwagon and loaded the ‘new Jerusalem’ with a politically oriented social-welfare meaning that was definitely earthbound, but which kidded many people that the Labour Party was a Godly influence. In the critical 1945 General Election, aspiring PM Clement Attlee declared the Labour Party would build a ‘New Jerusalem’; in this dream at least, socialists could all sing from the same hymnbook. But there would be no jewelled buildings or golden spires in the new flats, estates and tenements of post-war Britain. The New Jerusalem would be constructed in a hurry with a lot of reinforced concrete, enforced austerity and social-architecture theory – the Luftwaffe’s preparatory demolition completed by ‘Hell-Drivers’ in trucks storming about the country like Valkyries high on diesel fumes. And it must be said that Blake would have found little to admire in the philosophy of either state-controlled, or liberal, socialism. He was against its principles at the most fundamental level. First, the idea of ‘equality’ would have repelled him. As he wrote in his explosive work The Marriage of Heaven and Hell: ‘One law for the lion and the ox is repression.’ Individuals are absolutes; by our own thoughts and actions we become either ‘sheep’ or ‘goats’. Man desires to be a free agent and every human being is different, while all share in the ‘Divine Humanity’ to such degrees as individuals may experience. Man’s highest state is ‘spiritual liberty’ and this is realized minutely and particularly in individuals, not collectively. Man’s liberty increases as he discovers his spiritual dignity. Where lies this dignity? It lies in the realization that Man is a spiritual being, a spiritual being of infinite, not rationally predictable, potential. Contrary to Thomas Paine’s Rights of Man and the Rousseau-Voltaire faction, Blake did not believe Man was basically ‘good’, but basically God. And God, as the German ‘mystic’ Jacob Böhme (1575–1624) had taught him, had two apparently contrary aspects, and Man was caught in the outflow of these until he woke up. 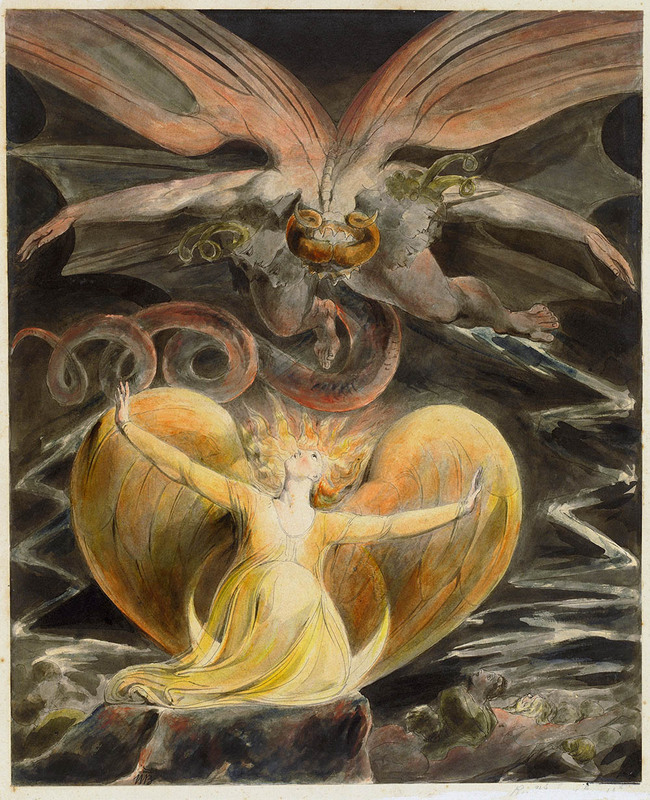 In the dual aspects of God’s nature could be found the only ‘historical dialectic’ that caught Blake’s attention. He was not interested in any alleged ‘class struggle’: such would be a chimaera, a tale of jealousy and envy for the embittered. True wealth resided in the spirit. Man does not ‘belong’ to society; we are all, Blake believed, members of the Divine Body, co-existent with God. Blake’s ‘Albion’ is not another word for ‘Society’. Politics boils down to convenience; society in general is a frightened gang, full of ‘accusers’ and the spirit of accusation against anyone who ‘breaks ranks’ – such as Jesus, whom Blake did not identify with the ‘workers’, but with the Imagination. All this explains the emphasis in ‘Jerusalem’ on the ‘Mental Fight’. Every person can hear the voice of ‘Satan’ or false ego (attached to the world of nature) and the voice of the angel – that is, the spiritual being. The ‘prince of this world’ is Self: ‘self first, self last, self all the bloody time!’ as my mother used to say. This false self hides the true God. Blake had read in the Bible and in the Hermetica, as well as in the works of Neo-Platonists, Gnostics and ‘Rosicrucians’, a consistent message confirmed by his chosen teachers Paracelsus and Jacob Böhme. Primal Man had fallen from his spiritual dignity as a result of what esoteric spiritual Tradition has called the ‘love of the body’: a fatal and narcissistic fascination with the reflection of Man’s eternal form in nature. Blake found his inner conceptions truer to spiritual reality than what his ‘vegetable eye’ could see of what was apparently ‘outside of himself ’. The rule of Nature divorced from God was a cruel and tyrannical rule, and the ‘Satan’ of the material creation was effectively the ‘false ego’ of the universe: strutting about arrogantly with his ‘rules and regs’. Blake – and this is important to grasp – believed the philosophy and science of his time was pushing Man further and further into this ‘desert’ of abstracted time and space. Well, here we are. We’ve arrived. We’re deep into the sand and do not perceive eternity in its grains. Blake would not be at all surprised to see what the Hubble telescope has brought to our vegetable eyes: an endless ocean of exploding and imploding forces that expand or contract as the current leading theory supposes, all done with numbers and spectroscopes. If we could smell the ‘grandeur of the cosmos’ (as presently seen), it would largely stink, of methane and worse, clouded with gaseous abortions: sole oases of escaping light in an endless desert pocked with ‘black holes’. Blake called the ‘guv’nor’ of the natural universe ‘a very cruel being’, awesome in his Goliath-like way, but cruel, and blind. And that cruelty dwelt in ourselves. Dealing with it, grappling with the forces of our inner nature, was the Mental Fight that ‘Jerusalem’ was all about. You cannot build the New Jerusalem with brick or stone; it is built with love and tears and the sacrifice of the false self that hides the Real. The masons of the Great City are the men and women of Imagination fed on spiritual truth. Regardless of the distortion of Blake’s words into some patriotic heaven on earth, the ‘hymn’ ploughs on to work its expressive magic and, to no one’s surprise, was heard and sung at the wedding in Westminster Abbey of Catherine Middleton and Prince William – now a song for a ‘new age’ of democratic, rational, emotional monarchy, or perhaps, a yearning for something better than what we think we ‘have’ now. I have no doubt that Blake would have been flattered by the attention: he had spent the larger part of his creative career ridiculed and suppressed. Nevertheless, it is hard to imagine Blake could have stomached for a minute the use of his words to promote recruitment and enthusiasm for the First World War. He would have noted, I suspect, that the ‘sword’ that did not ‘sleep in the hand’ line was preceded, as we have observed, by a glaring emphasis on the ‘mental fight’. The patriotic emphasis of ‘Jerusalem’, as we know it, would require considerable qualification in order to secure the author’s approval for the use of his work. Blake regarded his country as one that had fallen from a primitive grace, an epic simplicity. The country’s primary goal should be to rediscover its magical, spiritual science, secreted like a fugitive in the land, to restore itself to full ‘manhood’ – that is, to re-integrate its energies as you would a broken Man. That ‘Man’ he called ‘Albion’: the spiritual idea enfleshed in the British Isles. Every Briton was spiritually a part of him and shared in his catastrophic Fall, the diminution of his powers, and his division into lesser potencies. To reduce Blake’s vision of the Primal Man to a tune and sentiment about nationalist ‘victory’ would have appalled him while confirming his conviction that everything that tumbles into the material world is fatally distorted both in substance and in meaning. Blake’s vision is really too big, too fundamentally disturbing for many today who have, in my experience, inherited not the ‘excluded tradition’ that Blake embraced, but a philosophy or philosophies the very opposite of what Blake was advocating in poetry and painting and music. Matter is king; Man is matter: organism gene-driven. 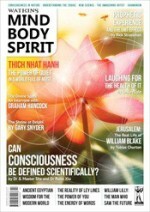 There is in the Western, and especially European, artistic, scientific and political establishment, a seething well of outright hostility to anything whatsoever smacking of ‘Western esotericism’, all of which is consigned to a dustbin of outmoded beliefs, a haven for eccentrics and Luddites. Smirking and sneering at spiritual ideas is prevalent and encouraged. Who dare put his or her head above the parapet? It was so in Blake’s own time, not so very long ago, and it is so today. More surprising is it then that Blake has become a ‘national treasure’ (ugly phrase) of the exportable British Art Industry while becoming accepted as the author of a popular, arguably nationalistic, hymn of pride: something to keep the English happy. As this book demonstrates, an historical understanding of William Blake is impossible without a good knowledge of the cultural forces prevailing in his lifetime. In many respects, Blake failed to meet his prime audience, the English nation – a failure that I think made him more eager to assert in the last decade of his life that he considered ‘publication’ of his works accomplished when the letters ‘flew all about’ his room to be read by the ‘spirits’ who would convey the works, as we might say today, into the collective unconscious. 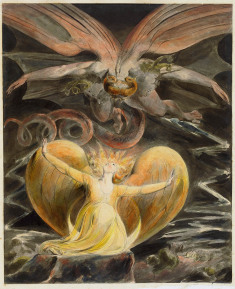 In the spiritual worlds, Blake believed he enjoyed a big fan club, whereas in the England of George III, the Regency and George IV, significant members of the ruling establishment targeted Blake as an enemy. You don’t have to lock a man up or hang or transport him to render his voice un-hearable. Poverty would ensure that only brave, more searching spirits would approach his door. 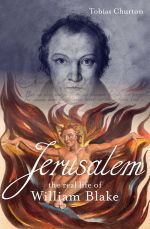 This is the first published biography to take in the new knowledge about the authentic spiritual background of Blake’s Nottinghamshire-born (not ‘Cockney’) mother and the spiritual influences available to his upbringing. This knowledge has enormous implications for understanding the real Blake, helping us to see him in a far richer, broader context than hitherto, while scotching once and for all the persistent notion of Blake as a startling peculiarity, a kind of curiosity or blip in the history of art and letters, to be explained away by psychological, vaguely religious or even psychiatric jargon. In the process of investigation, we shall have to overcome much of the romanticism that has enveloped Blake’s reputation from the time of Alexander Gilchrist’s beautifully written biography (1861; 1880) and we shall find some painful surprises and the puncturing of a few perhaps cherished illusions on the way. I am sure we shall find Blake as challenging as he was to his contemporaries, and while distance of time will doubtless lessen the shock value that might have brought tremors to Gilchrist’s Victorian audience, I have no doubt that Blake’s continued relevance to our predicaments will still induce as much dismissive (if veiled) hostility, as it will generate joy for the open minded – for Blake was a saint. And the miracle is, that we have heard of him.